I was born in Ohio in 1961, and music was part of my home life from the start. My family moved to a suburb of Pittsburgh, Pennsylvania in 1963, and Mom started teaching me to play piano when I was three. I composed my first song when I was four. In third grade, the band director introduced the band program to the students. I told my parents I wanted to play either trumpet or drums in band in fourth grade. Later, I realized they encouraged me to play trumpet to keep me from taking up drums! They also weren’t sure if I could pucker, so first they bought me a bugle. I learned a bunch of bugle calls in about two weeks for Cub Scouts, and when fourth grade came along, playing trumpet came easily. In eighth grade I took trumpet lessons. My teacher had me memorize interval exercises first, which was one of the best musical things I ever did. Then we worked in the Arban book. We did long tones, too. I worked up to holding a note without interruption for a minute and seven seconds. “The Tonight Show with Johnny Carson” aired in the afternoon when my lesson time started, and when the Tonight Show Band played a feature number, we’d stop to hear Doc Severinsen play a solo. In high school, I entered the advanced band right away and even won the first chair by audition. I played lead trumpet in the jazz band and played in the pep band, a German band, a Dixieland band, a brass quintet, for the choirs, and in anything else that needed a trumpet. I made friends that I still have today. Music is like that. Maynard Ferguson was very popular, and we played lots of his charts. I got to play the solo parts. 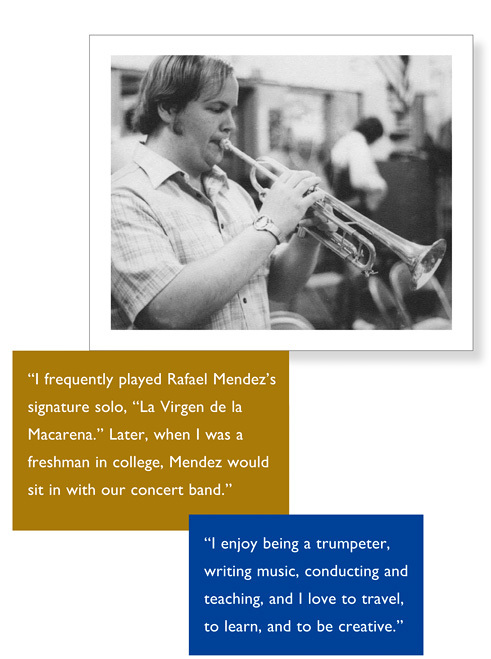 In my senior year, I frequently played Rafael Mendez’s signature solo, “La Virgen de la Macarena.” Later, when I was a freshman in college, Mendez would sit in with our concert band, but I was so shy I said very little to him. He passed on not long after, and I learned this lesson: to meet one’s heroes is terrific, but to place them so high on a pedestal that you fear to get to know them is a mistake. I didn’t just play trumpet. I studied piano and guitar and learned electric bass, but I did normal things, too, like playing football with my neighborhood friends and exploring nearby rural ranches and farmlands. I was on the local swim team for a season. I collected stamps. I mowed lawns and trimmed hedges for income and worked at McDonald’s one summer. And I bought my first car – a big, beautiful, white ’68 Dodge Monaco with a black vinyl roof. Nice. After high school, I went to Los Angeles to pursue a career in music. 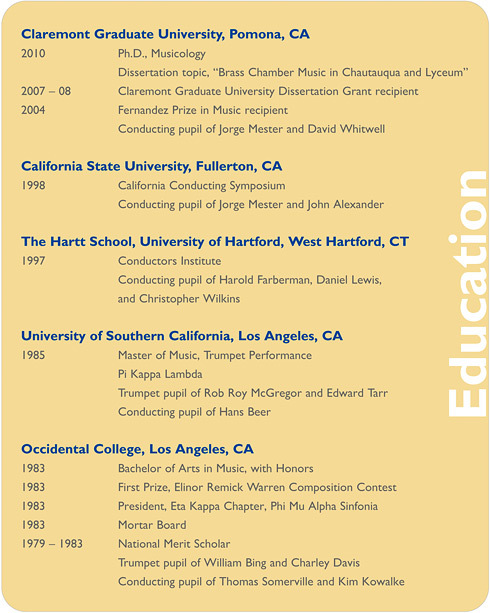 I earned my BA with Honors in Music from Occidental College, I was inducted into Pi Kappa Lambda (the national music honor society) while earning my MM at the University of Southern California, and in time I returned to school to earn a PhD in Musicology from Claremont Graduate University. More recently I’ve enjoyed work as an expert witness and sleuthing out motion picture mysteries as a forensic musicologist. There’s always something new and interesting around the corner.